Easy starting when engine is Cold, but Hard starting when engine gets Warm. These were the car symptoms I faced several weeks ago. A gradual symptom that started several months back when the engine wouldn't start immediately unless I quickly depressed the accelerator upon starting the ignition key. This tip seemed to be helpful for several months until it began to fail requiring me to depress the accelerator two or three more times. I've nearly reached 300,000 miles on my odometer and haven't run into much action until now. So here I go again to get my hands dirty and to figure out exactly what is causing this problem....that is, the engine starts perfectly fine when cold, runs well during idle, but has trouble starting once the engine has warmed up. So I did some research and resulted with most suggestions pointing towards fuel related causes or fuel flooding. I finally decided to tackle them one by one. Replaced the fuel filter, replaced the fuel pump, and replaced the fuel regulator. And then, surprise...neither of these replacement parts solved the problem. Needless to say, I was nearly stumped. But I didn't give up, I just continued deeper into my studies. 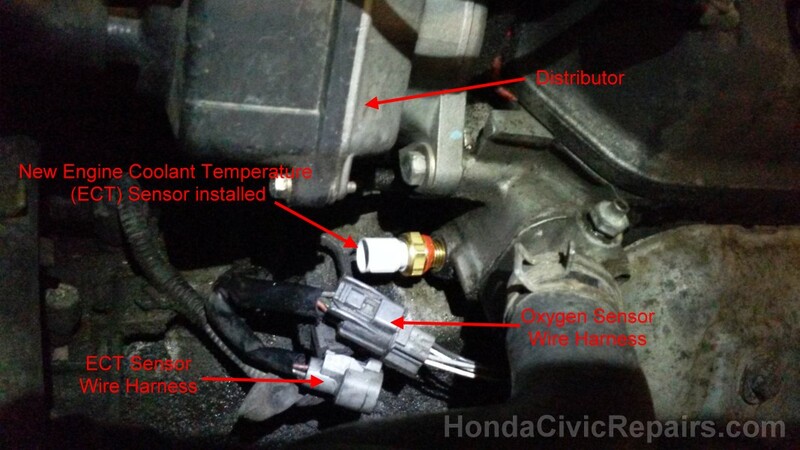 But this time, I stumbled upon a few resources that explained how part of the ignition process controlled by the computer relies on the Engine Coolant Temperature sensor. When an engine is cold, the computer sends signals to the fuel injectors to release more fuel. But when an engine has warmed up to operating temperatures, the computer sends signals to the fuel injectors to release less fuel. It makes sense....adjusting for cold weather temperatures during ignition. But what happens when the computer gets the wrong readings from the Engine Coolant Temperature sensor? Well, you may have already guessed it. 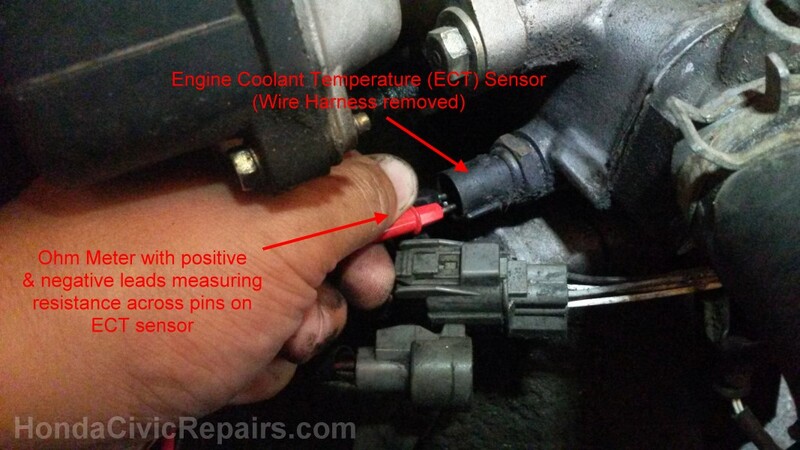 Your car would have trouble starting on a warm engine if the ECT Sensor indicated false values for the computer in that the engine is cold thereby instructing the computer to release more fuel through the fuel injectors upon ignition and flooding the cylinders. And that's exactly what happened in my engine all along. 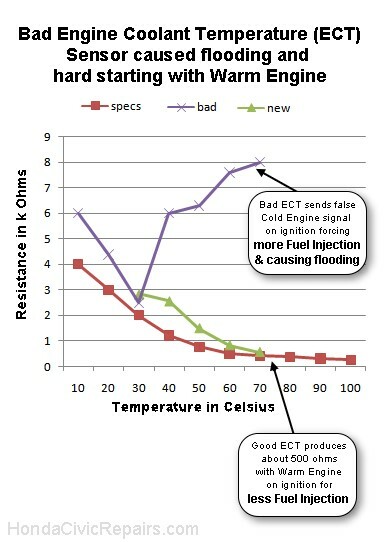 The ECT sensors were off the charts indicating false readings that the engine was cold with the warmest reporting only 30 degrees celsius. Instead of producing 300 ohms of resistance at the ECT sensors to indicate a warm engine of about 80 degrees celsius, my bad ECT sensors produced 8,000 ohms of resistance indicating that my warm engine was freezing cold. This helps explain why the engine released too much fuel upon ignition while the engine was warm resulting in flooding and hard starting. The failed ECT sensor no longer had the capacity to indicate that the engine has warmed up and reached operating temperatures of about 80 degrees celsius in order to start the car normally with less fuel injection. See the chart I plotted below. 1. Using a multimeter and setting it to read resistance (ohms). 3. Disconnected the 2-pin wire harness for the ECT sensor and measured the resistance between both pins while the engine is cold. Measured the ambient temperature in my location and matched the resistance against this temperature through the chart along the specification path (specs). 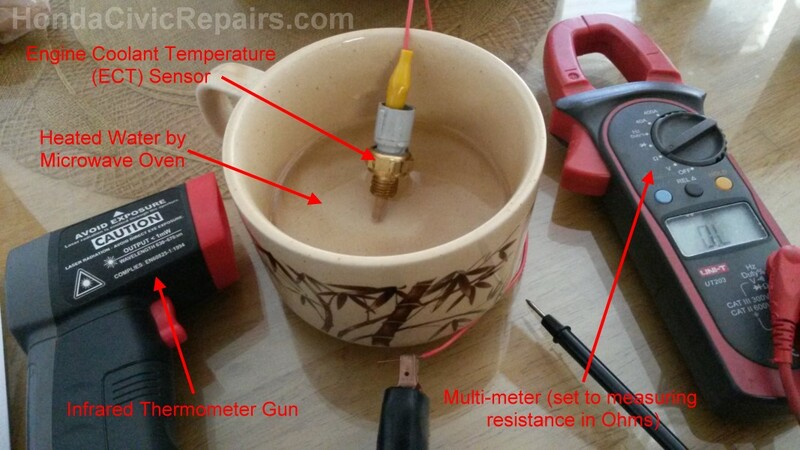 If the reading is within reasonable limits, then the ECT sensor is producing good resistance for such temperature. If not, then the ECT sensor needs to be replaced. 4. Reconnect the ECT sensor and start the ignition. Put the vehicle in neutral and depress the accelerator to 2000-3000 rpm in order to heat up the engine until the radiator fan turns on. 6. While being careful not to touch any hot components, performed step 3 carefully to measure the resistance while the engine was warm. 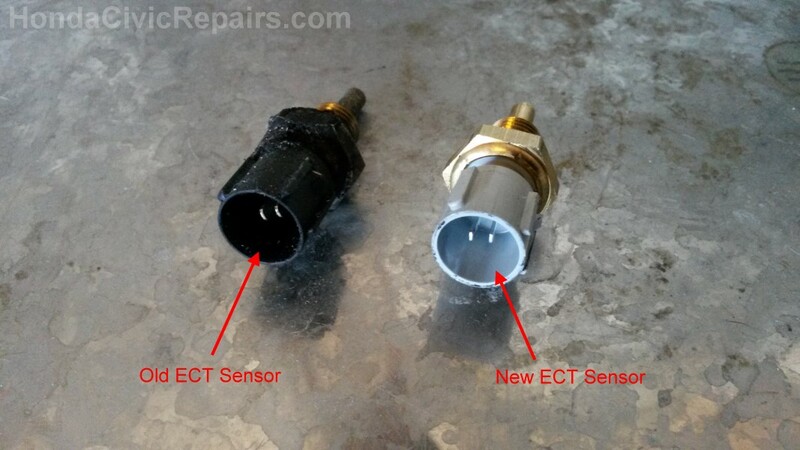 Changing the ECT sensor was as easy as removing a bolt but requiring a pan ready to pick up the coolant spills upon removal and having a bottle of more coolant ready for refill.